I had the immense pleasure of experiencing my first Comic-Con this past weekend in San Diego. 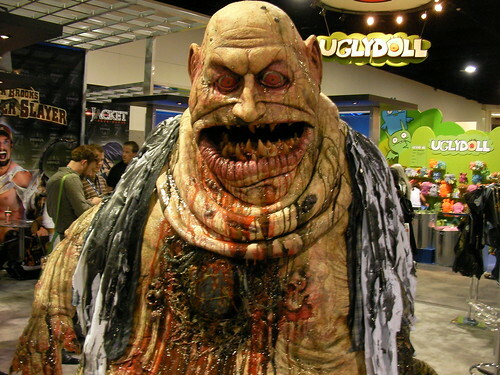 Comic-Con is a massive event for all things comics, science fiction and anime in all its media manifestations (comic books, movies, TV shows, video games, card games, toys, collectibles, cosplayers and LARPers). 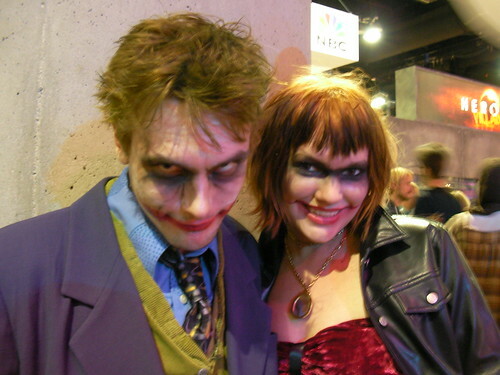 Comic-Con’s essential ingredients are a giant expo floor, numerous panel discussions and speakers, TV and movie actors signing autographs, tons of parties and the official masquerade ball. Most attendees make a noble attempt at dressing up as their favorite superhero, villain or anime character. The Dark Knight flavor of The Joker was by far the most popular getup there this year. 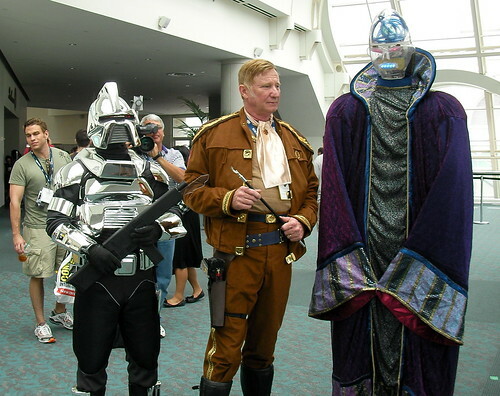 Battlestar Galactica, old and new school, were also quite popular. Throughout the day I overhead many noobs proclaiming they had wished they had dressed up and they were certainly going to next year. I couldn’t help but think of the similarity to Burning Man virgins who go home knowing exactly what art project they’re going to do next year. With 150,000 fans packing the halls it sometimes was a bit of challenge getting in and around. All the big panels had massive lines snaking around the walls of the convention center and across passageways. 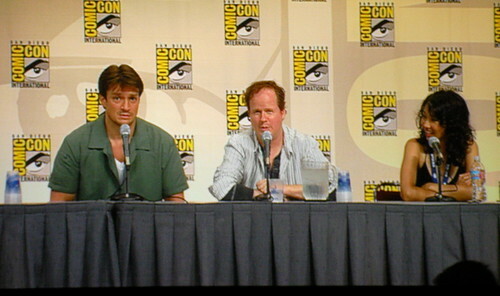 Some of the most popular panels were Joss Whedon and the cast of Dr. Horrible, the Watchmen where some exclusive footage was shown and Terminator 4 where a new trailer debuted. The expo hall is a football field or two of space filled with booths small to enormous. Many of the big movie studios and television networks had massive displays hyping their latest offerings. Some examples are a full scale Owl Ship from the upcoming Watchmen movie, a larger than life Iron Man suit, a Dunder Mifflin set from The Office, a two-story Guantanamo Bay prison complex complete with a unicorn you could mount from the movie Harold & Kumar Escape from Guantanamo Bay. Of course there are the old standbys like a life size Jabba the Hut you could snuggle up with, a Lego Indiana Jones and ridiculous sized Pokemon characters. This montage I shot of the expo floor will you give you a tiny sense of what it was like. On the edges of the hall, you could actually buy or trade comic books and get autographs from your favorite artists. Plenty of collectibles and vinyl toys as well. There’s also a video games section at one far end that was a ghetto compared to the prime space the studios got. Tucked in between G4’s mobile studio and NBC’s The Office set was a small space occupied by pals Kent Nichols and Douglas Sarine of Ask a Ninja fame who were signing autographs and pimping their remake of Attack of the Killer Tomatoes. Even though the film has yet to be shot and is at least a year off from screening, it’s never too early to build buzz. 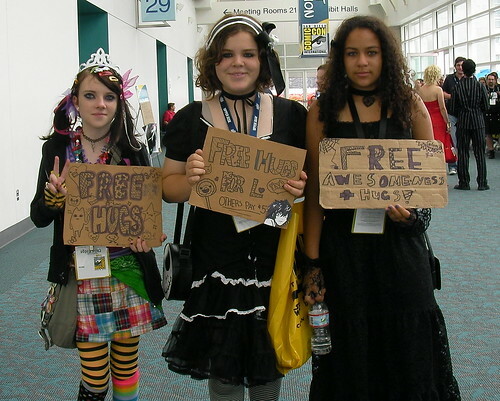 A curious thing I noticed this year were many young cosplayers with FREE HUGS signs. A mixing of cultural and Internet memes maybe? You can find tons more photos & video in my Flickr set and everyone else’s. 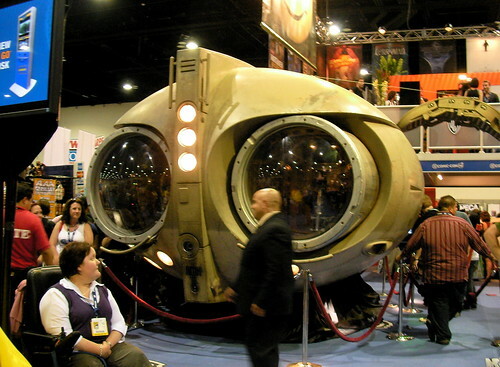 Sci-fi blog io9 has tons of coverage as well (full disclosure: I was hired by io9 to shoot video at Comic-Con). Conclusion: An amazing event, you should go! Just book your hotel now as it gets impossible to find a room as the event approaches.